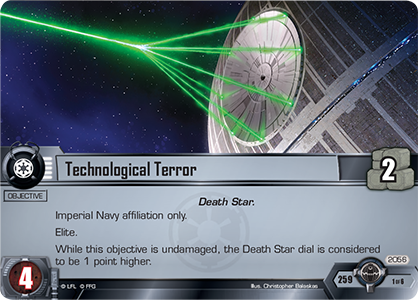 Fantasy Flight Games is proud to announce Technological Terror, the sixth Force Pack in the Opposition cycle for Star Wars™: The Card Game! Throughout the background of the classic saga, the shadow of an unimaginably massive battle station looms over the galaxy. The two Death Stars, constructed in A New Hope and Return of the Jedi, wield the nearly unimaginable power to wipe out an entire planet in one devastating superlaser blast. 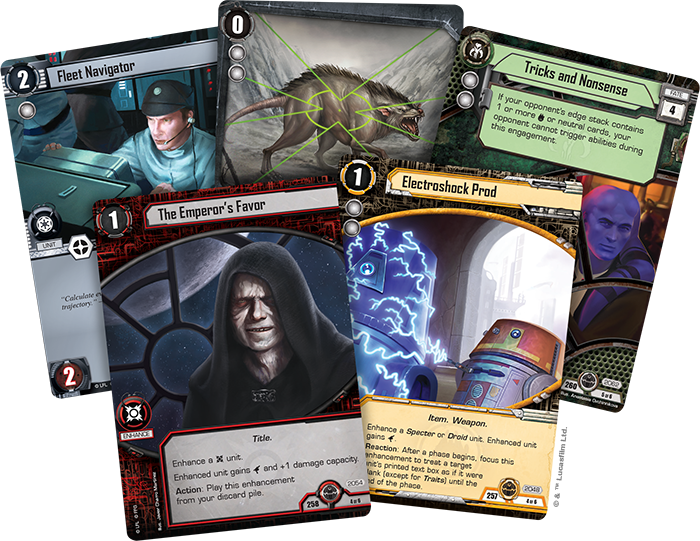 Now, it’s time for the Imperial Navy to wield that same power in Star Wars: The Card Game. Of course, before you can see your battle station fully armed and operational, you have to build it—which as you might imagine, takes a massive amount of resources. Fortunately, this objective set is packed full of resources. You’ll find one copy of Control Room (Technological Terror, 24), which provides two resources. A Fleet Navigator (Technological Terror, 220) provides a single resource, although he can also provide a tactics icon for combat in a pinch. You’ll also find two copies of the Death Star Engineer (Technological Terror, 2058). This character offers extremely efficient economy, providing one resource on a non-limited, one-cost character. 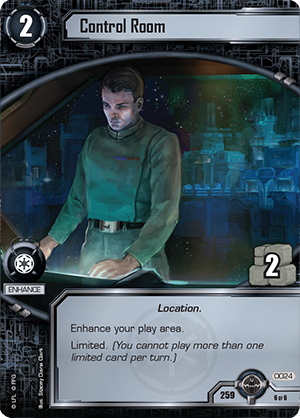 The catch is that the resources generated by your Death Star Engineers can only be used to play Space Station or Capital Ship units. 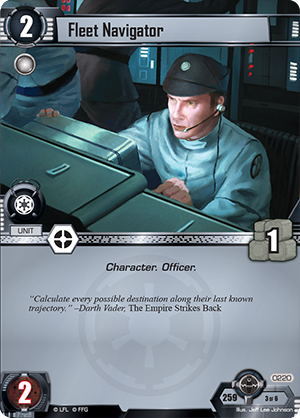 Still, if you’re building your deck around the might of the Imperial Navy, this won’t pose much of a drawback. 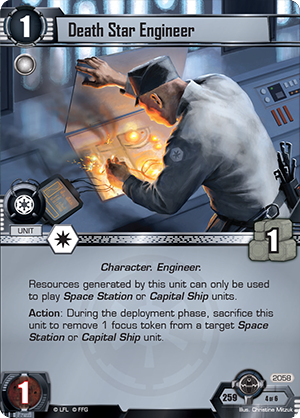 In addition, you can sacrifice your Death Star Engineer during the deployment phase to remove a focus token from a Space Station or Capital Ship, ensuring your greatest threats are always in play. Even the objective of this set can help give you the resources that you need to construct your superweapon. Technological Terror (Technological Terror, 2056) provides two resources and bears the elite keyword, ensuring that you can use these resources each and every turn. 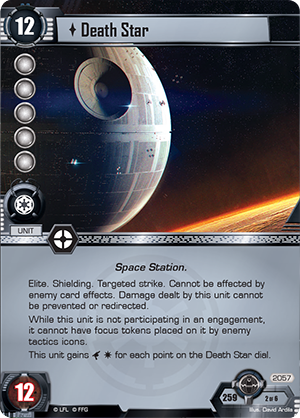 What’s more, while this objective is undamaged, the Death Star dial is considered to be one point higher, moving you even closer to victory. 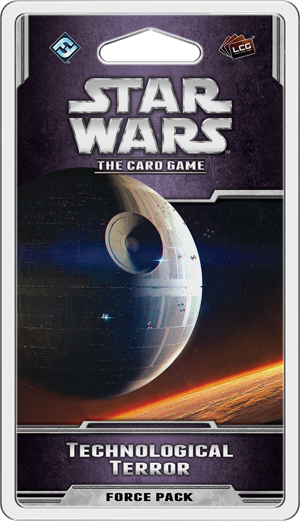 You might even reveal this objective with the Death Star dial at 11 and immediately win, denying the light side a final chance to make their attacks. Once you’ve gathered your resources and focused the might of the Empire behind your project, you’ll be able to bring your Death Star (Technological Terror, 2057) online. Compared to other units in the game, the Death Star is unbelievably powerful. It costs twelve resources, but it also has a damage capacity of twelve, making it incredibly difficult for your opponent to destroy. Its only printed combat icon is a normal tactics icon, but it gains a unit damage and a blast damage for each point on the Death Star dial! Even at relatively low numbers like four or five, the Death Star will still be destroying enemy objectives and wiping out elite enemy units in a single strike. Combine that with the targeted strike keyword and the fact that its damage cannot be prevented or redirected, and you’re well on your way to seeing why the Rebellion was terrified of the Death Star’s power. 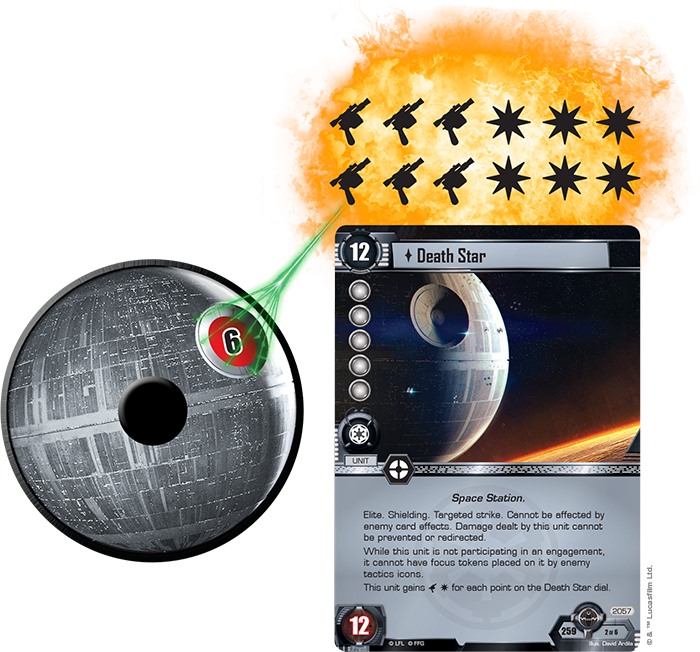 With the Death Star dial at six, the Death Star gains six unit damage and six blast damage icons! All of that would be bad enough for the light side, but the Death Star could still be controlled fairly easily by tactics icons or other methods. Fortunately for the Imperial Navy, the Death Star’s offensive power is only surpassed by its nearly impregnable defenses. First, the Death Star bears the elite and shielding keywords. It cannot be affected by enemy card effects. And while the Death Star is not participating in an engagement, it cannot have focus tokens placed on it by enemy tactics icons! Can the Death Star even be destroyed? It’s certainly possible in the case of an all-out assault. You just have to determine if you’re the Rebel leader who’s going to make it happen.